Carlisle United director and co-owner Steven Pattison acted as a stand-in official in their 1-0 FA Youth Cup second-round win over Doncaster Rovers. A linesman replaced injured referee Rebecca Welch after 50 minutes and with no other official present, qualified referee Pattison, 60, ran the line. Carl Taylor's penalty gave Carlisle victory 10 minutes into extra-time. Doncaster thought they had levelled two minutes from time but Pattison's raised flag ruled the goal out for offside. "I've never seen it before. It's a bit strange at our level," Carlisle youth team coach Alan Moore told BBC Radio Cumbria. "We're pleased that somebody was there to step in and let us complete the game. For the lads to have to come back again wouldn't have been fair." The match had originally been in jeopardy after the River Petteril, near Brunton Park, burst its banks, covering the playing surface on Monday, but the flood water was pumped away in time. 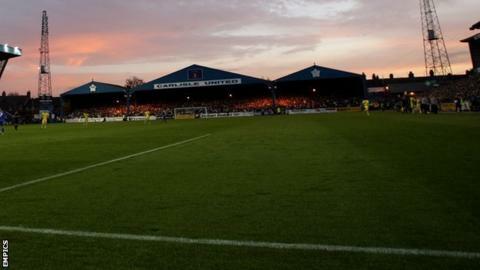 Carlisle will now host Preston in the third round.